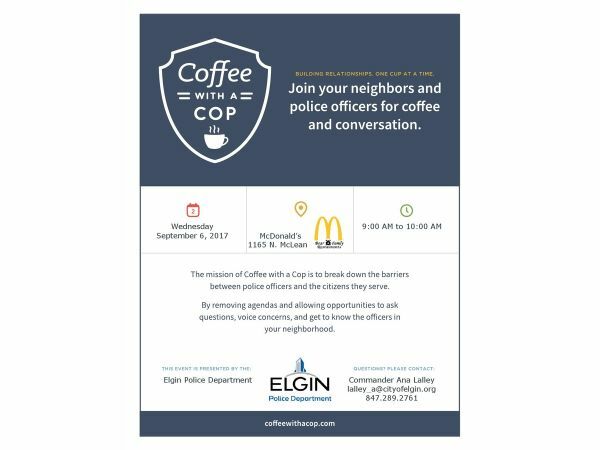 Come out and enjoy a cup of coffee on Wednesday September 6th, from 9am-10am with the Elgin Police Department. The Mission of Coffee with A Cop is to break down the barriers between officers and the citizens they serve. By removing agendas and allowing opportunities to ask questions, voice concerns, and getting to know the police officers that serve your neighborhoods. While enjoying a fresh cup of McDonald’s complimentary coffee.